This past Saturday, my wife, sister, and I traveled to Durham, NC to pick up our long-awaited order of California grapes. 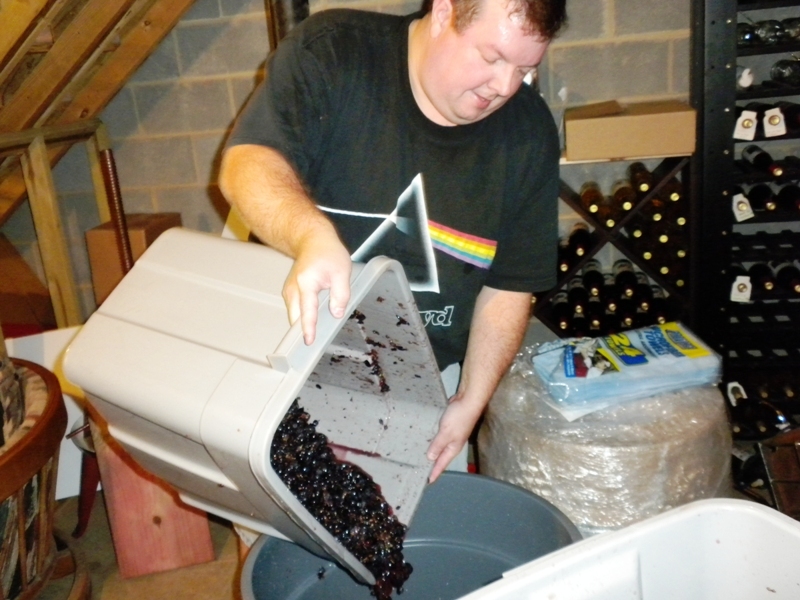 A group of winemakers in the North Carolina area have been doing this for a while, and the person coordinating sought out other local winemakers through a wine forum that had interest in participating in his annual order. He coordinates the purchase and uses his contacts to negotiate a purchase through Delta Packing. Everyone comes to his house for pick-up. 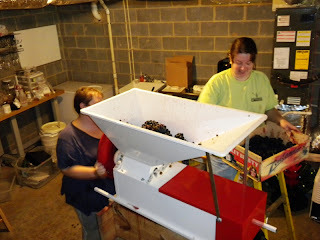 He also lets amateur winemakers use his crushing and destemming equipment if they do not have their own. It is generous of him, and I'm sure local winemakers appreciate the opportunity to make wine from grapes that are not available locally. We ordered 14 lugs of Lodi Old Vine Zinfandel, and 4 lugs of Lodi Barbera which equates to about 504 lbs of Zinfandel, and 144 lbs of Barbera. Considering the quantity, we rented a mini-van for the weekend. The lugs that the Old Vine Zinfandel came in were made out of wood, which was a nice surprise, I expected them to be plastic lugs like the ones that contained the Barbera. The wood lugs have painted designs and are well-stained from the grapes themselves. We are planning on taking those boxes apart and using them to make a table top or something. The Zinfandel berries were larger in size than the Barbera, and were bigger clusters. However both types were very deep dark purple (almost black) in color. I tasted them, and could tell that the sugar level was very high. 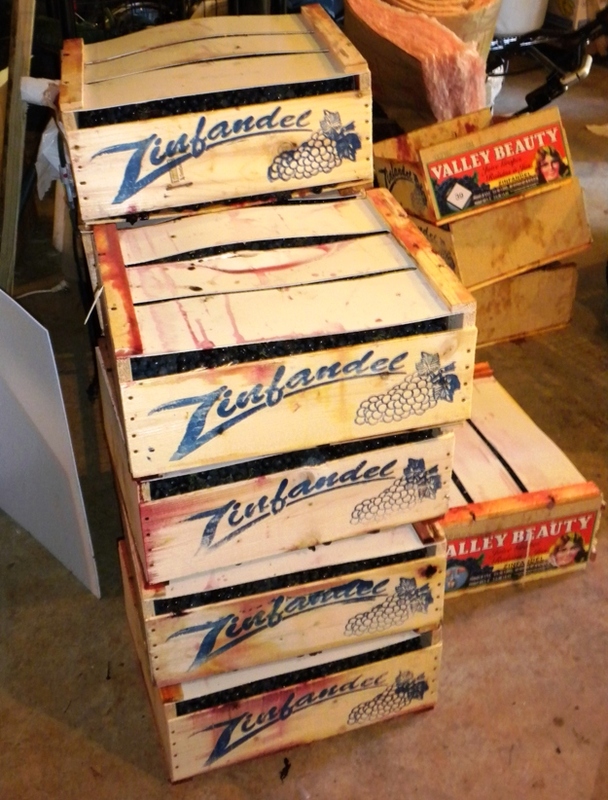 When we got them home, we hauled the grapes down to the basement on our garden cart. The day before, I had built a small make-shift stand for the crusher/destemmer. It got the job done, but I think I am definitely going to spend the money next year and get a proper metal stand. My sister helped my wife and I crush and destem. Her favorite job was dropping the clusters into the top. I am not sure if it was the fact that the stems had begun to turn brown (and thus became more like wood than vegetative growth) or it was just that the stems were very thick, but the Zinfandel grapes were very difficult to move through the mechanism. After we finished crushing and destemming all the grapes, we were all exhausted. We split the Zinfandel batch up into two 32 gallon Brute containers for fermentation. The Barbera was divided up between three fermentation buckets. When I tested the sugar levels that day, the Zinfandel came in to around 25o, and the Barbera averaged out to about the same. My pH meter had flaked out on me, and I hadn't had time to get a replacement probe, so I used the numbers the rest of the group who got the same grapes came up with for the pH and TA. Their numbers averaged out to about 3.60 pH and the TA was about 0.60%. Pretty much perfect I think, I don't think I will have to make and acid changes. That day I added Opti-Red, Lallyzme EX, and Pectic enzyme to each of the musts to break down the grapes and extract as much color as possible. I also added some SO2 to prevent any wild yeasts from starting fermentation. The next morning, I tossed in the yeast. In one container of Zinfandel I am using BM45, the other RP-15. The Barbera, two out of the three containers are using RP-15, the third is using D254. As of now, they are fermenting away, I'll keep everyone updated with the status. I was supposed to be a part of this group purchase also. Glad to see the grapes turned out to your satisfaction. I couldn't participate because I was in the midst of a move from Blowing Rock to Granite Falls. Hope to see you at the next wine club meeting on 10/19.